Lillian Too says do what successful corporate tycoons and businessmen from China, Hong Kong and Singapore do. 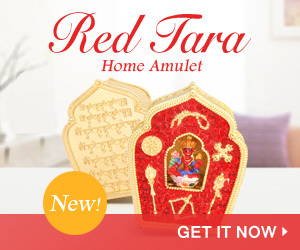 Make a serious investigation into how you can use feng shui to give your company the competitive edge that will make it surge strongly forward. Even western-style management gurus are fast discovering what an incredible complementary tool feng shui can be to sound management strategies. Start by using it to get the best out of your company’s most precious asset – your employees. Do this by creating a workspace so harmonious and balanced that employee tension, bad health, weakness and carelessness become things of the past. An office that has good feng shui will see employees working faster with greater accuracy. Productivity improves as does creativity, so employees easily adopt an attitude of multi-tasking. They will enjoy coming to work. Problems of absenteeism and staff falling sick will be substantially reduced. In time, the energy of the office is brightened. Enhancing profits, boosting sales, finding new avenues for growth and everything associated with strategic management falls into place. Operations run smoothly and obstacles to productivity dissolve. This is sure to increase efficiency. Even the most negative of employees will benefit from the improved energy that will pervade the office. 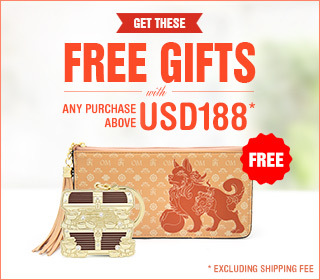 Investing in good feng shui for your staff is the best way to create a win-win situation. When staff face their best working directions, they will usually be happy and free of tension; then they will feel inspired and there is nothing they cannot achieve. It will be like opening the floodgates to a boost of healthy energy. This is the exciting promise of using proper feng shui techniques to enhance the energy of office spaces. So how do you get started? Look around your offi ce and see what kind of answers you are getting to the following questions. Do you look forward to coming to work each day? If coming to work each day is a chore, the chi energy of either your personal space at work, or perhaps the whole office, is suffering from bad feng shui. You might want to investigate further. Does your office have bright white lights? If the workspace is dark and full of shadows, or when yellow light makes the office so cozy you feel like going to sleep, then something might be wrong with the lighting. Does the office feel cramped with tight corners? This is the surest way of having stagnant energy accumulate within the workspace. It stifl es creativity and reduces productivity. Even the best-qualified and most positively motivated staff cannot work well in such an environment. You might want to rethink the layout of your office. When desks and seating arrangements confront each other, it creates the chi of tension and misunderstanding, attitudes that are not conducive to cooperation and harmony. Confrontational tables are those that directly face each other. You need to re-arrange the desks to overcome this. Do you have long corridors in your office? When an office space is so built-up that every officer has his/her own room and these open from a long corridor, there is sure to be tension and office politicking. This is the major affliction affecting large companies and the reason why factions get formed within organizations. Long corridors have the effect of creating poison arrows within the office environment, a major fault that is in need of remedy. Are all your walls white? Colour schemes within the office environment have a direct impact on worker productivity, and thousands of pages have been written about the need to create a professional look at work, hence the popularity of white walls. White is also the colour of yang and is the most complete of colours, in that within white are all seven colours of the rainbow. However, white must not be overdone to the extent that there is no balance. When all your walls are white, you need to introduce other elements such as plants and other decorative features to soften the excessive yang energy. Is there a lot of tension in your office? When there is bad blood in the office and factions are fighting silent battles with each other, something is seriously wrong with both the management and feng shui of the office. When the feng shui is improved, animosity will be reduced. This is one of the surest indications that the energy of the space is simply not right. Does the office feel cluttered and tired? One of the most important things about space is that it must never be allowed to degenerate into a state of clutter and stagnation that it gives off an air of tiredness. This means the chi is also tired. In such an environment, it is tough for the company to do well. If your office feels like this, it is time for a major spring-cleaning exercise or renovation. It might cost money, but when the energy and fl ow improves, you will discover that the money has been well spent. Here are two simple ways feng shui can make a difference to your office. 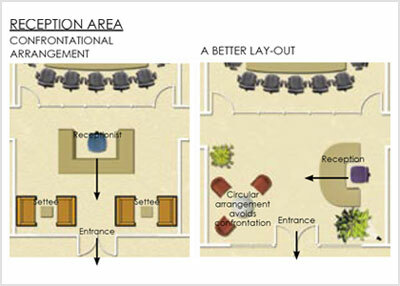 First take a look at the two sketches of a reception area into a small office. In the first sketch, you can see an arrangement that is confrontational, both to the receptionist as well as to anyone entering the office. This is the first impression that visitors (as well as employees) have of the office. This kind of office layout is a popular way of setting up the entrance into an office, but is not a good idea, especially when the office is a sales or marketing office. It is also a bad idea having two sets of settees flanking the reception area, as this suggests the energy of potential conflict. In the second sketch, the reception area is more welcoming to employees, clients, customers and visitors. Here, the receptionist (who often doubles up as the person answering your telephone calls) will be happier and more productive in his/her work. Definitely, the receptionist will call in sick less often. At the same time, the circular table in front of the receptionist is also more conducive to the fl ow of chi, and the waiting area has been made friendlier and more in tune with the rest of the office. 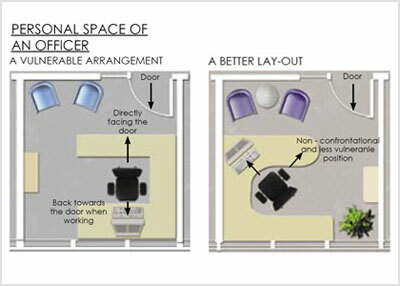 Second, we take a look at the design of a personal space for an officer of the company. In the first sketch, the officer is sitting directly facing the door, but when he works on the computer, he is forced to turn around and have his back to the door. This is one of the most taboo of feng shui sitting guidelines, since having your back to the door suggests you can get stabbed in the back. It is better if the computer is moved to the side wall. An important tip about sitting directions is that every officer should sit facing one of his auspicious directions based on the KUA formula of Eight Mansions. If you do this for every employee, the cumulative effect can bring astounding results. In this second sketch, note the officer’s positioning is a lot better than in the first sketch, as he is still facing the door, but no longer facing it directly. It is a diagonal effect, which is always better. The edges of the office desk are also rounded, and the computer is situated correctly. Here the balance and flow of energy is more conducive to higher productivity, and better health and morale for the officer occupying the space. If the auspicious directions of the KUA formula are followed, this office will bring a healthy and productive workspace for the officer. In addition to improving the energy of working space, good corporate feng shui can make office spaces personally more effective for individual employees, creating win-win situations for both employer and employee.